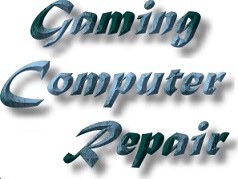 ﻿ Wellington Telford Home computer Repair, Wellington Home Laptop Fix, Wellington Shropshire Home Gaming PC Fix. Our friendly, qualified, highly experienced Telford computer engineers have many years experience in Wellington Telford Computer Repair and Telford computer fault finding. At one time, it was possible to perform a full Telford computer reinstallation onsite. However, times change. Modern home computers require regular updates to ensure that Windows runs correctly and that the computer is secure. A&A Computers believe in quality workmanship. When we repair a home computer, we clean internal components and we perform full updates. This takes time but the service is provided at no extra charge. We can visit clients to Repair Wellington computers in their home. This will usually be to resolve BSOD (Blue Screen Of Death) issues. If the home computer is running quality software and is installing updates without issue, then in many cases we can fix computers with BSOD problems quickly and simply (using software). In a few cases, the blue screen will be caused by memory issues which we can also fix on site. If we need to remove a home computer, we copy clients data to our secure server before starting work (this can take several hours). Performing a full Windows reinstallation can take over an hour. Identifying, installing and checking the correct drivers can take over an hour. Installing all available Windows updates can take several hours (we often perform updates overnight). Copying clients data back to their repaired Telford computer can take several hours. This is why many Telford clients deliver their system to us, or we collect locally (we offer free local collection and free computer return with our Wellington Telford Computer Repair service). Put simply; if a full re-installation cannot be performed correctly onsite. 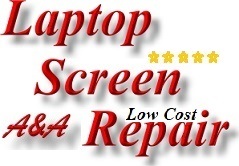 A&A Computer Repair can collect the system and perform a full diagnosis - perform full legal Telford Windows computer full re-installation (using your existing license and official software). 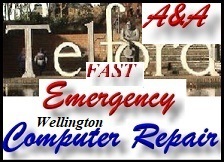 Most Wellington Telford home computer repairs (Wellington Telford Home PC Repairs or Wellington Shropshire Home Laptop Repairs) are completed within 24 to 48 hours and the system is usually returned with 24 hours of the system passing its final checks. If the home computer is infected with a virus, we usually advise deleting the current Windows installation and re-installing Windows, with the correct drivers etc and then installing good Antivirus software. Home computer (Home PC and laptop) support, Wellington Telford Home Computer Repair & home computer service forms a large part of our business with over 90% of that business coming from recommendations & re-orders (we do not advertise). 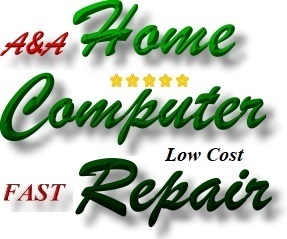 Our home computer repair service differs from others in many ways, and these include providing a full featured service with totally honest advice & ongoing support. 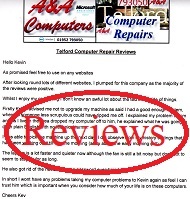 We also provide a Telford UK home computer repair service, Shrewsbury UK home computer repair service, Shifnal UK home computer service, Shropshire UK home computer service etc. A&A UK Computer Repair can identify & remove spyware, pop-up viruses etc & restore the PCs speed & performance & can often silence noisy computers (noisy PCs). 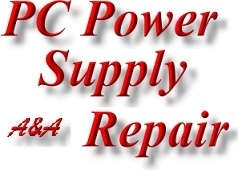 We are so confident of the quality of our service, that A&A Computer Repair can charge far below the going rate for that service & our low overheads (we do not need to carry large quantities of stock) allow us to provide top notch service at rock bottom prices. A&A Computer Repair can also advise on computer upgrades for home computers (home PCs) which others claim cannot accept a memory upgrade, hard disk upgrade or video card upgrade (graphics card upgrade).